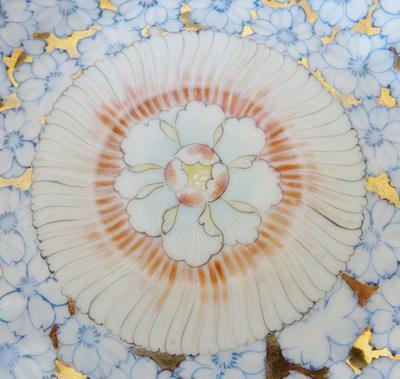 I purchased this lovely eggshell porcelain tea set in a full hand painted floral pattern (I think lotus flowers) & was wondering if you would be able to provide me with any info on it. 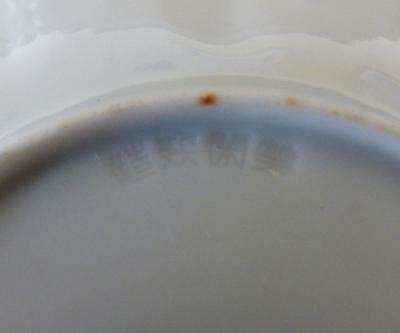 The cup & side plate are unmarked but there is a 4 character mark to the base of the saucer. I have tried to find out what this is but with no success & the only relatively similar tea set I have seen was dated as c18th Qing Dynasty. Any help/info would be greatly appreciated. Comments for Eggshell porcelain fully hand painted tea set unknown impressed mark? Sorry, I did not see the mark. Marks are usually in the center. I looked only at the item itself. Anyway, it says who made the item, but it could be either Chinese or Japanese. I cannot read all characters, as they are not clear enough. Again, if it is Chinese it has to be modern, factory made. Could be older if it is Japanese. Either way, it looks like export for the west. Thank you for your response, are the character I have pictured to the base of the saucer not Chinese? This is what led me to believe this was Oriental rather than European. If this is made in China, it would likely be a modern factory product. There is nothing typical Chinese or Asian about this. Could as well be European.